There are few natural plants on this world that can be legitimately called a “superfood. Moringa is the ultimate “super food”…a powerhouse of health and nutrition. 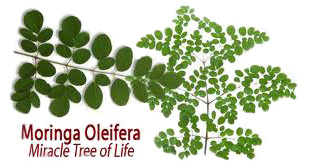 Moringa Oleifera is a tree that primairly grows in the foothills of the Himalayas. However, it can be found scattered among portions of India, Malaysia, and the Philippines. 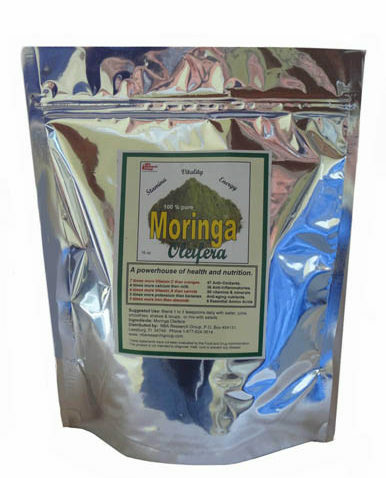 The primary benefit of Moringa Oleifera is the high nutritional value of the leaves. Moringa continues to amaze the scientific world with its amazing balance of antioxidants, minerals, and amino acids. Moringa contains a combination of 90 vitamins & minerals, 47 anti-oxidants, 36 anti-inflammatories, 8 essential amino acids and anti-aging nutrients. Scientific research also suggests mitochontrial sirtuins (a group of enzymes) that exist in every cell are the master regulators the divert energy into cellular preservation. Moringa oleifara is very rich in such enzymes, With all the health benefits of this miracle herb, it can easily be termed as the most nutritious herb on Earth. 7 times more vitamin C than oranges… 4 times the calcium of milk…4 times more vitamin A than carrots…3 times more potassium than bananas…and 3 times more iron than almonds. Moringa has Vitamin A (Beta Carotene), Vitamin B1 (Thiamine), Vitamin B2 (Riboflavin), Vitamin B3 (Niacin), Vitamin B6 Pyrodixine), Vitamin B7 (Biotin), Vitamin C (Ascorbic Acid), Vitamin D (Cholecalciferol), Vitamin E (Tocopherol) and Vitamin K. Moringa is considered a complete food as it contains all the essential Amino Acids required for a healthy body. Moringa also contains the following minerals: Calcium, Chloride, Chromium, Copper, Fluorine, Iron, Manganese, Magnesium, Molybdenum, Phosphorus, Potassium, Sodium, Selenium, Sulfur, & Zinc. Other Beneficial Nutrients include: Chlorophyll, Carotenoids, Cytokinins, Flavonoids, Omega (3, 6, 9) oils, Plant Sterols, Polyphenols, Lutein, Xanthins, Rutin, and more. 1. 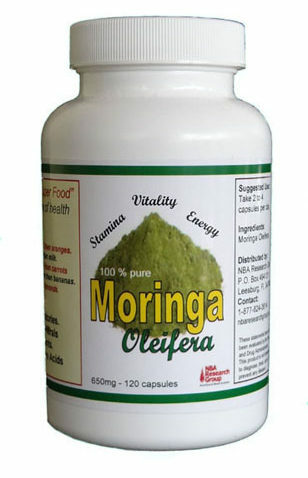 Moringa Oleifera supplies the body with a tremendous amount of energy. This allows you to work harder at the gym, at work, or at home, so you’ll burn more calories throughout the entire day. 2. Moringa Oleifera helps naturally reduce your caloric intake by suppressing your appetite. Moringa Oleifera has many other benefits such as: improved mood…improved digestion, improved immune system function…protects the stomach lining…treats stomach ulcers boosts energy levels…lower blood pressure…Plus MANY MORE! There are no known side-effects.